Summer is really slipping away, so I thought I'd show the simple spool rack I made. I've mentioned before that I'm not a big DIY person, I just don't have the room or desire right now to do big projects, but I love a simple craft that I can make my own. I've seen a few spool racks online and I knew I wanted to make something similar. I didn't have any vintage spools, so I found some wood ones in a craft store. 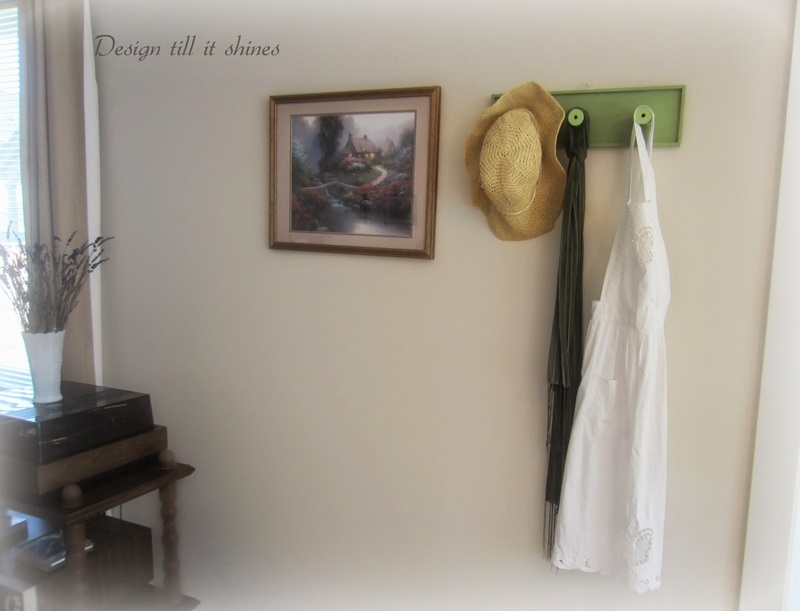 I painted a wood plaque a soft green and added my spools in a lighter green, distressed them a bit and I was done. 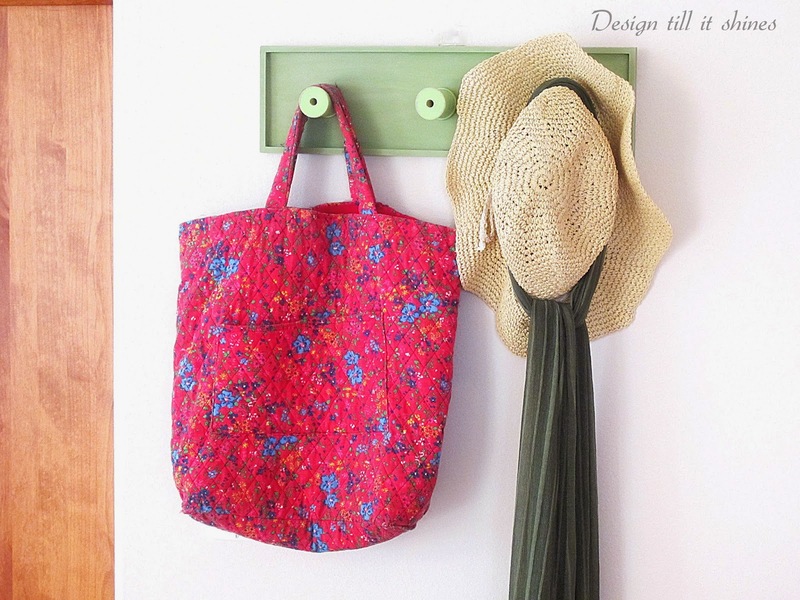 I originally wanted to hang vintage towels or aprons on it to give it a farmhouse look, but I came across a colorful red quilted bag in a thrift store so I decided to start from there. 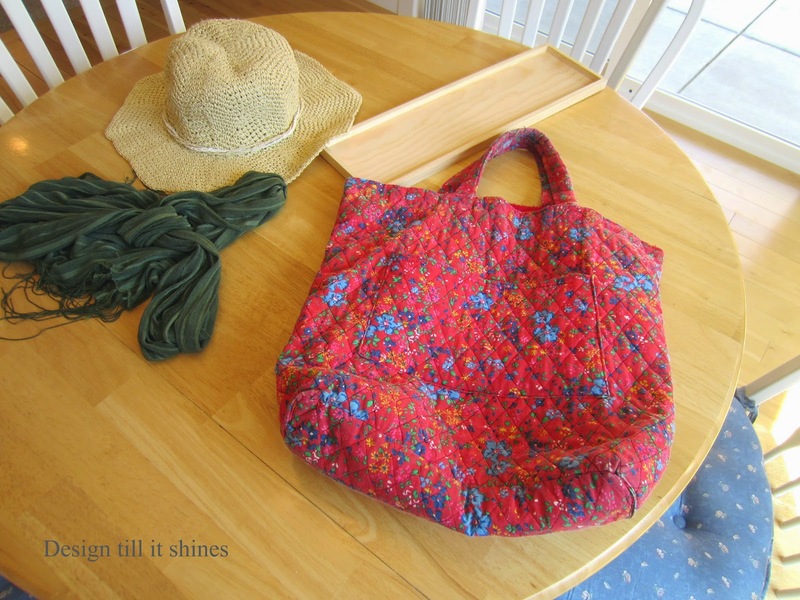 It was in one of those thrift stores with little organization and the bag I found was pretty dirty, but I knew it had potential. I found a hat and scarf while thrifting and added an apron I already had, so it made it easy to put it together. I got the inspiration for using the red bag from this calendar. I get inspired from the smallest of things at times. I really loved the colorful dresses displayed here, especially the red one so I knew I wanted something colorful to add to my spool rack. These sleeveless dresses are displayed in a very unusual way, back to back, but they are so lovely with all the colorful flowers and I love how they are blowing in the breeze. I'm not really a red person, I love small touches of it though and loved the blue flowers on the bag. The knitted flower on the hat is a pretty addition too. I only have one vintage apron right now, but I'm hunting for more since I love aprons. 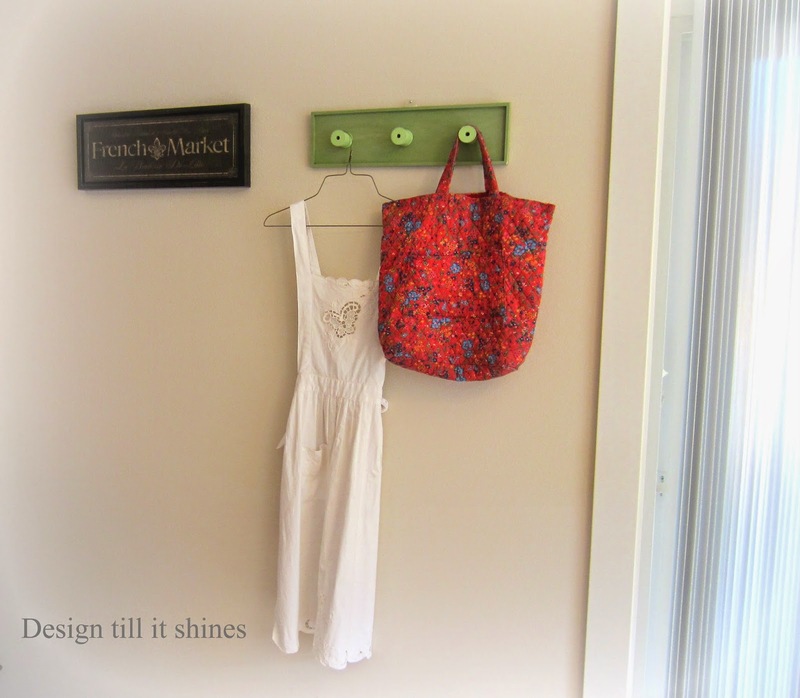 I also love the look of an apron displayed on a hanger. This is on my opposite wall next to the patio doors. 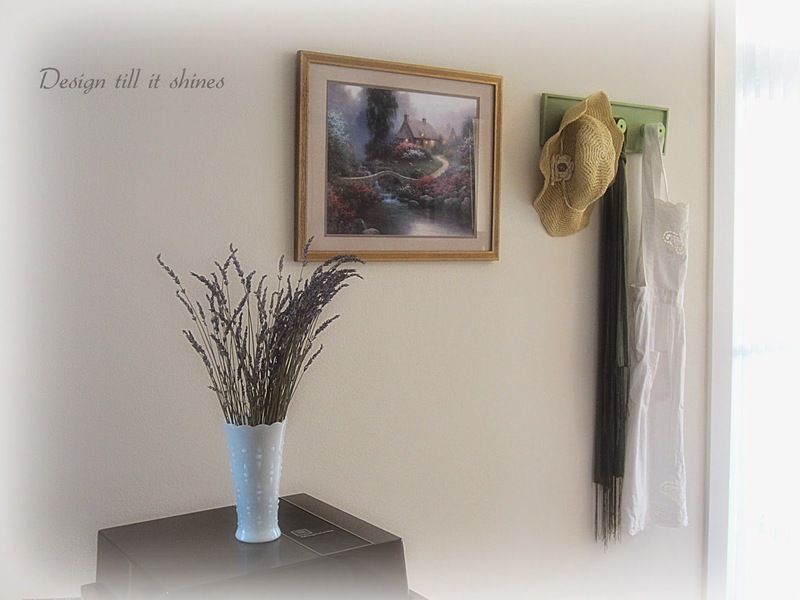 I have several vases of lavender so I added one to the top of our old stereo that hubby can't seem to part with. I'm working on it and the table it's sitting on isn't going to be around much longer either. I just work around everything and hope it all comes together. A little closer look at the apron with the lacy butterfly and floral edging. I like the vintage look of it with my floppy thrift store hat and scarf. Adding the bag gives a little different look. Either way it reminds me of the farmhouse look that I love. Another look next to the pantry and my faux hydrangeas. I love this charming garden picture that I've had for years. It's hard to see the detail in this pic, but there is a footbridge over a small creek and colorful flowers surround the cottage. I really like the feel of this with the garden picture, it pulls it all together for me. I just don't think you can go wrong if you let simplicity guide you. 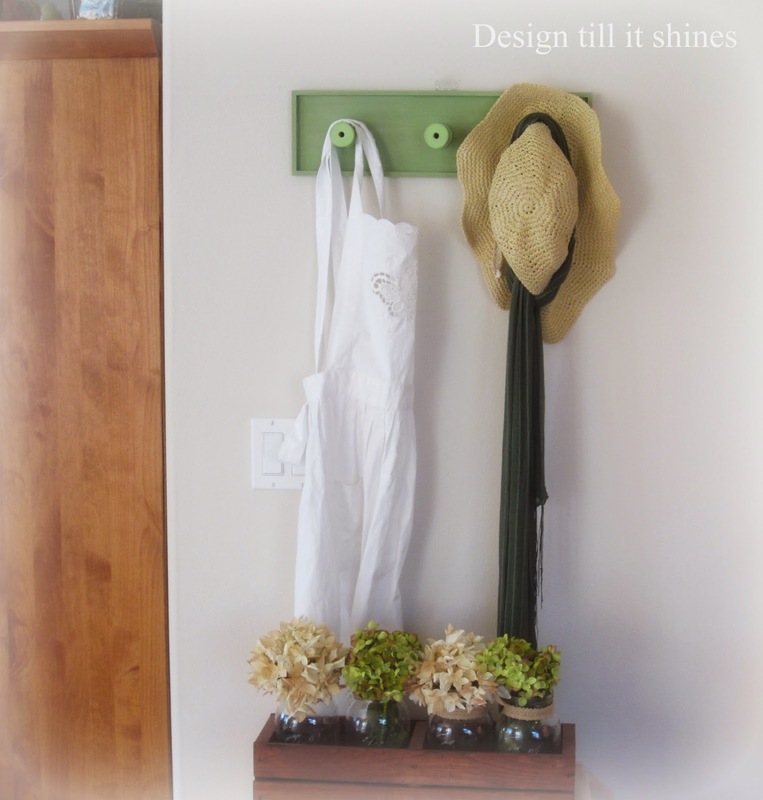 And with the addition of floppy hats, aprons and some lavender you have a simple prairie style look that takes you back in time. Thanks for visiting! Your spool project came together so nicely. 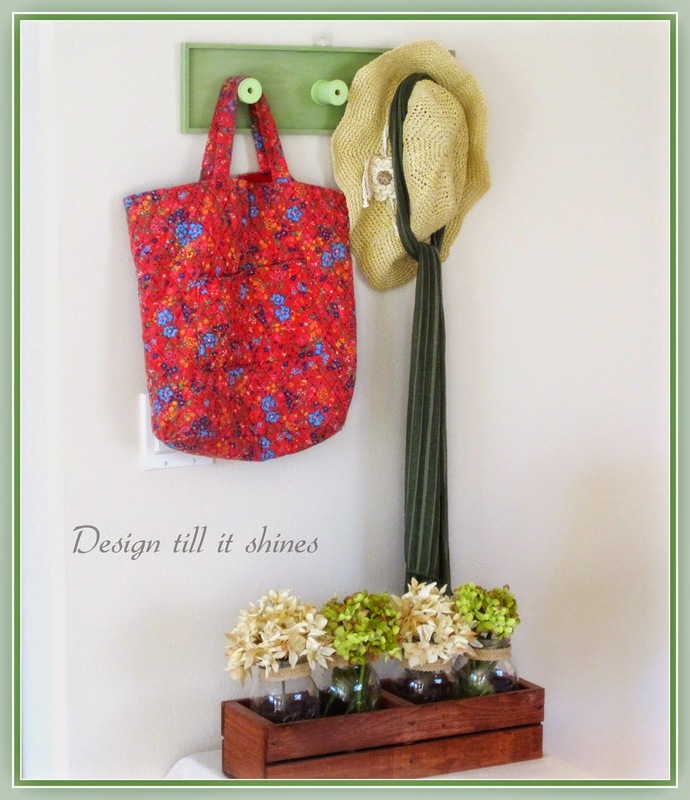 I love how you styled it with the bag and hat, very inviting and homey. What a great project. I love it hanging above the hydrangeas in the box below.. So true, simplicity is always the best idea...Blessings! What a fabulous honor! Thank you so much. I loved reading through these quotes and starting my day with a big bouquet of inspiration. You're delightful! I love the spool project--that is a nice green too--looks so fresh! You should craft more often; you are very creative! Your spool rack is lovely; I especially like the soft, calming colour! Diane, Love the spool rack! 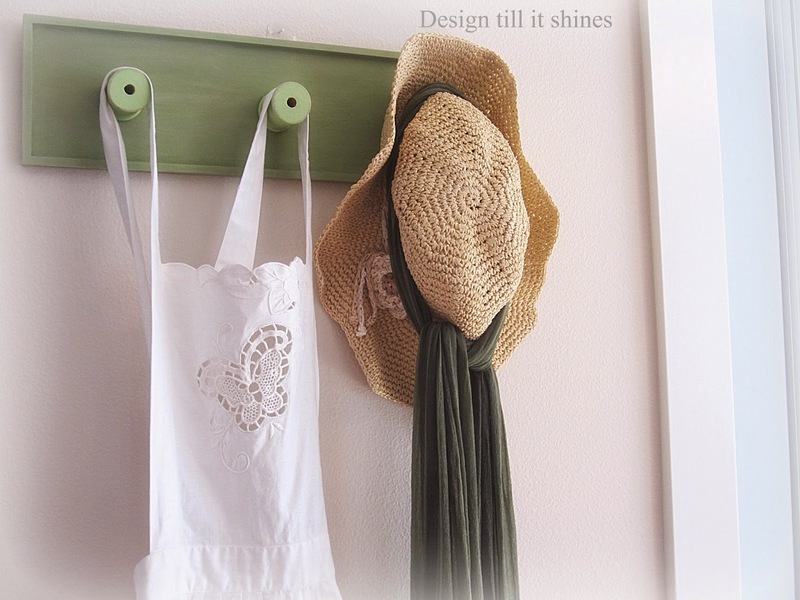 What a great project for hanging up your beautiful things, love the pale green. 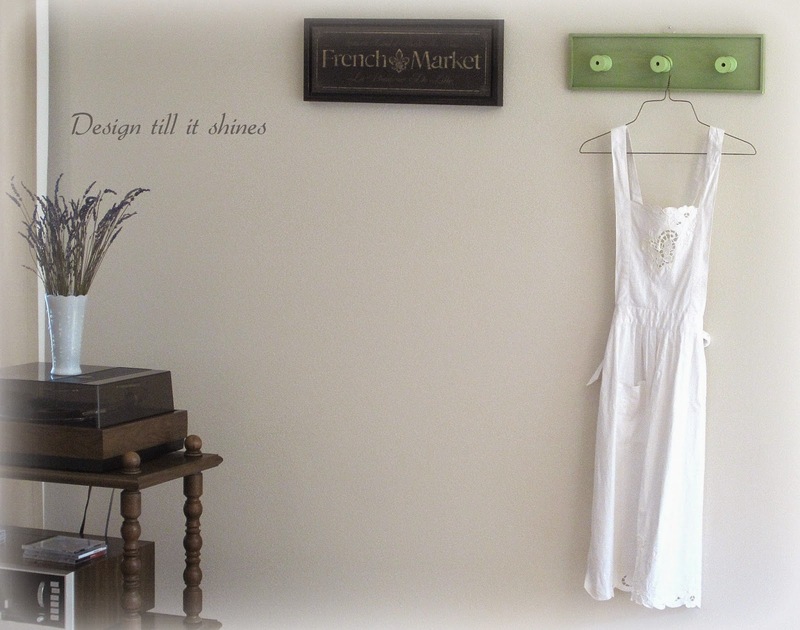 Your white apron is so pretty and feminine ~ I love how it looks with the pretty green of your spool rack (such a great idea). 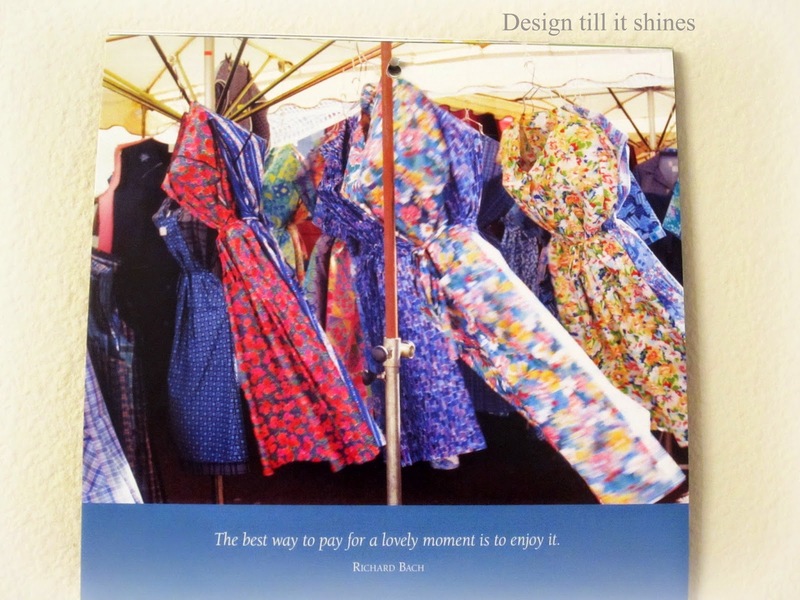 I love what you said about letting simplicity guide you ~ great advice! Your spool rack is such a clever idea. Love the simple look of the pretty white apron and the lavender. Thanks so much for sharing.